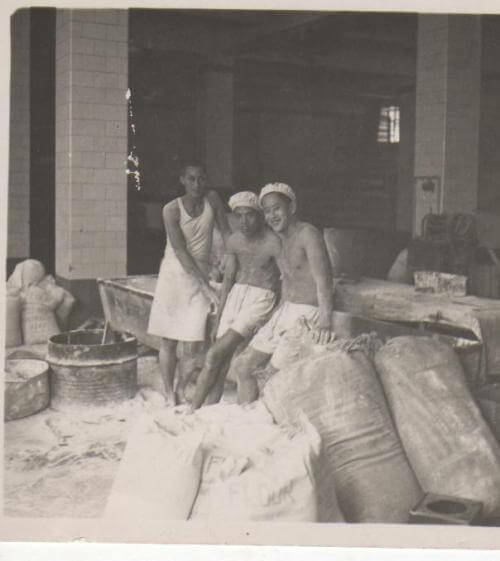 Brian Edgar: 1938 was an important year in the modernisation of baking in Hong Kong. In November Lane, Crawford moved to a fully mechanised facility in the Happy Valley section of Stubbs Road – my father, Thomas Edgar, had become the company’s bakery manager in the spring, probably to oversee the move from Wanchai (“see 1” below). But it seems that the Garden Company, a Chinese enterprise in Kowloon’s Castle Peak Road, had got there first when it opened a fully ‘industrialised’ facility earlier in the year (2). I was inclined to doubt this until I read Tak-Wing Ngo’s essay on pre-war Chinese industry, which showed that, contrary to some views, Chinese enterprises were often ‘quite large, and (their) operation considerably modernized’. (3). In any case, while the Garden Bakery was performing sterling service for the Nationalist Government in its war with Japan, (4), I doubt that it sought to compete in any serious way with Lane, Crawford for the ‘European’ market before the Japanese attack. There were other many other bakeries in Hong Kong before the war: with at least five small Chinese ones in Wanchai, for example, which, along with the large Garden facility and no doubt others in Kowloon, suggests a well-developed market for bread in the majority population. The most important of the Wanchai bakeries was the Ching Loong in Queen’s Road East, and this was taken over by the British bakers during the final days of the hostilities, when Stubbs Road became unusable, and was also the scene of volunteer bread-making for the hospitals during the first 15 months of the occupation (5). There were probably also Russian bakeries in Kowloon- the Russians generally specialised in ‘fancy’ products – although I haven’t yet been able to establish exactly when these were opened (6). The Dairy Farm had its own facility which kept producing bread during the hostilities; although the building seems to have been little more than a large metal shed, the process was mechanised there too. After liberation my father found that the use of the Stubbs Road bakery for other purposes made the resumption of production difficult and it probably wasn’t until well in to 1946 that things were almost back to normal (the machinery never fully recovered). Garden Bakery, as a Nationalist enterprise, had also been taken over by the Japanese, but business resumed quickly and by 1948 it was seriously challenging Lane, Crawford for the ‘European’ market (7). After an unsuccessful manoeuvre involving the bakery in that year, the company abandoned plans to build a more modern facility elsewhere in the island, and at some point decided to leave bread-making for more profitable activities. I still remember when my father (Ng Iu Cheung) was alive, he did mentioned to me that one of non-Chinese bakers at his Ching Lung Bakery during WW II was Thomas Edgar from United Kingdom. They communicated occasionally after the war. I think my father might have paid Thomas Edgar a visit in the 50’s.